Johnny Gat is on a mission, and that’s to get on your hard drive as soon as possible. Deep Silver have announced that the standalone expansion to Saints Row 4 will be released a week earlier than planned, hitting our shores on January 23rd. Bundled along with the news is this assuredly bonkers trailer showing off seven new weapons, all influenced by the deadly sins. This choice of weaponry means that Gat is armed with the power of lust, gluttony, greed, sloth, wrath, envy, and pride. But if you’ve played Saints Row before, you already knew that. It’s kinda Saints Rows thing. 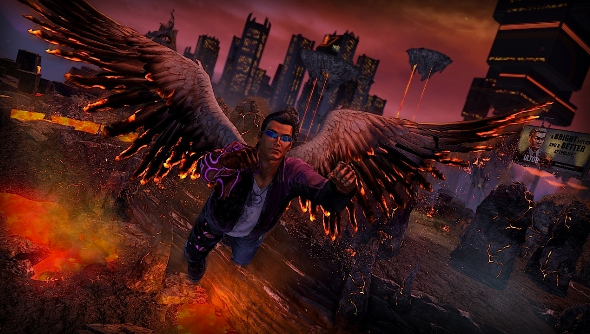 Saints Row 4 was one of our very favourite games of 2013 thanks you it’s superhero absurdities, so we’ve got big hopes for another chunk of excellence from Gat out of Hell.